Manju Jois is the oldest son of Sri K. Pattabhi Jois, recognized worldwide as the foremost authority on Ashtanga yoga. 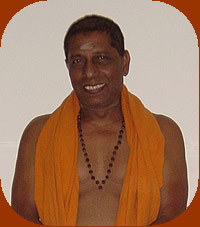 Manju started yoga at age 7 with his father and began teaching at age 15. He has taught continuously throughout the world for the last 55 years. This five-day training will present the Ashtanga yoga series and traditions in their purest form, providing a rare and privileged opportunity for beginners and experienced practitioners alike to learn from a genuine Indian master. Manju Jois uses only the ancient practices, offering truly authentic guidance for all who wish to follow Ashtanga's life enriching path to Enlightenment. The traditional Ashtanga yoga practice, a series of asanas (postures) known as The Primary Series or Yoga Chikista (Yoga Healing), followed by the Intermediate Series entitled Nadi Shodhana (Nerve Cleansing). Daily practice of the asanas purifies the mind and body while healing the nervous system. Manju, using the original Sanskrit so that students will benefit from the traditional form, will then teach the Nadi Shodhana Pranayamas breathing exercises. After this the students will practice Vedic peace chants (Shanti Mantras). Each day will conclude with meditation practice. Manju Jois's dedicated life-long mission is to provide training for students and teachers in the traditions of authentic Indian yoga. He is honored therefore to be able to offer guidance to all who wish to learn and benefit from Ashtanga yoga's ancient and time-honored practices. By the end of the week, students should be able to present the Primary Series in the traditional way (using Sanskrit commands) as well as teach some fundamental pranayamas and chants. A certificate of participation will be issued after the completion of the course(s). Teacher Training and Weekend Workshop, discounted cost is $1,070. The discounted cost for the entire package, including Teacher Training, Weekend Workshop, and daily Mysore classes, Saturday, Sept. 7 - Friday, Sept. 13 is $1,160. Mysore classes are with Manju's assistant Greg Tebb. Greg has been practicing yoga for over 34 years. He has been a student of Manju Jois' since 2000 having visited Mysore to practice with Pattabhi Jois before then. He asked and was granted Pattabhi Jois' blessing to teach, and has Manju Jois' blessing to teach into the advanced series. Chicago gets very busy at certain times. (Most about 25 minutes walking distance or more). All classes will be held at the Chicago Yoga Center. balance due before Monday June 3.